No discussion of Easter is complete without a mention of its much-anticipated precursor -- Fat Tuesday, also known as Shrove Tuesday or Mardi Gras. It's the last chance to party hearty before Ash Wednesday when Lent begins. In the old days, meat and meat byproducts, like butter and eggs, couldn't be eaten during Lent. So ingenious cooks used up all their dairy and eggs during Fat Week, from Shrove Thursday to Shrove Tuesday, by making crepe-like pancakes, called nalysnyky in Ukraine (similar to Polish naleśniki), and doughnuts called spurgos in Lithuania, krofne in Serbia, and pączki (POHNCH-kee) in Poland. In Poland, pączki are eaten on Fat Thursday or Tłusty Czwartek. The last six days of carnival season (karnawal) -- from Tłusty Cwartek to Shrove Tuesday -- are known as zapusty. Shrove Tuesday is known as Śledziówka or Herring Day when herring are eaten instead of pączki. Shrove Tuesday is also known as Ostatki, which literally means "lasts," and refers to the last day to party hearty before Lent begins. The start of Carnival season is usually on Twelfth Night or Epiphany, Jan. 6. The traditional Polish way to celebrate Carnival is with a kulig - a horse-drawn sleigh ride through the snow and a hearty outdoor meal like bigos cooked over an open fire. Things are changing, however, and bar-hopping is taking the place of kuligs. According to this Polish Blog by Transparent Language, Fat Thursday used to mark the beginning of Fat Week –- the period of great gluttony during which our ancestors would eat loads of lard (smalec) and bacon (bekon) washed down with vodka. 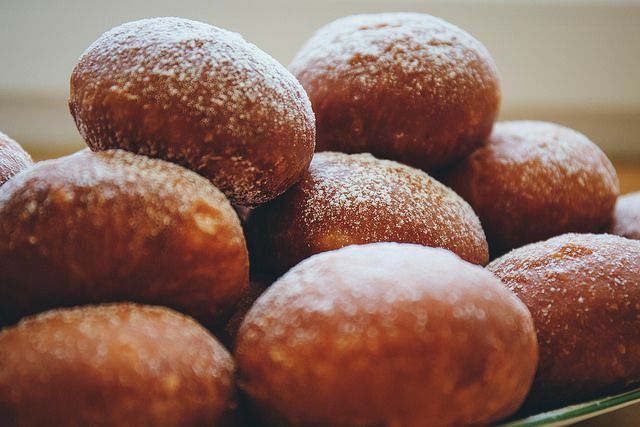 Nowadays, Fat Thursday is associated especially with pancakes known as naleśniki, bow-tie pastries known as chruściki, and doughnuts known as pączki. In the 16th century, the blog says, pączki were made with bread dough, filled with pork fat and fried in lard. Later, they evolved into a sweet pastry. Self-respecting bakeries in Poland never make their pączki in advance, nor do they use preservatives. The dough is made in the wee hours of the morning and is sold hot from the frying grease as soon as the doors open. Some home bakers fill a few pączki with almond paste instead of marmalade and the person who gets one of these is said to have good luck for the coming year. An old Polish proverb states, "If you don't eat at least one doughnut on Shrove Thursday, you will no longer be successful in life." Gone are the days when the window of opportunity for savoring pączki was 24 short hours once a year on Fat Tuesday. Now, most bakeries (in the United States and Poland) offer these chubby fry cakes the entire Carnival and even during Lent (shh!). So, go ahead, become a pre-Easter feaster. Will the Real Pączki Please Stand Up? Any fried-in-the-fat pączki lover will tell you that a bismarck and a pączki are not one and the same. Nor is a doughnut and a pączki one and the same. Sure, they may look alike but that's where the similarity ends. Pączki are made with a richer dough that has more eggs and sugar and they're cut larger, without a hole. When properly made, they look like huge, round baseballs. Some varieties have no filling, like my busia's, and are rolled while still warm in granulated sugar. Some pączki makers use prune, apricot, raspberry and custard fillings and dust with them with confectioners' sugar. Gourmet fillings (like fresh strawberries and whipped cream) are diluting the pure breeds, but prune and raspberry still hold sway. In Poland, the quintessential pączki is packed with rosehip marmalade filling and bathed in a flat icing with candied orange peel sprinkled on top. If time is keeping you from enjoying pączki, Polish Funnel Cakes might be a quicker way to go.